This was inevitable. Former graduate assistant, now assistant coach Mike McGeary has been placed on administrative leave. He will be paid during the leave term. Some are asking why he wasn't fired outright, given that he didn't stop the assault or call police. Neither the school nor the police are saying. 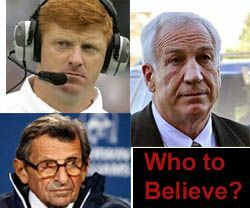 Asked if McQueary would be fired, [Penn State's new president, Rod] Erickson said "there are complexities to that issue that I am not prepared to go into at this point." Asked about the status of athletic director Tim Curley, Erickson said, "That's an ongoing topic of discussion. We'll return to that next week."